With the political winds on Capitol Hill due to shift in 2019, key Congressional Democrats are already looking ahead to a year in which they hope to pass a major infrastructure bill, introduce a national vehicle miles travelled (VMT) pilot, and connect a national infrastructure program to the fight against climate change. Separate news reports over the last couple of weeks have had incoming House Transportation & Infrastructure Chair Peter DeFazio (D-OR) discussing what it would take to finalize a bipartisan bill, and expressing support for a VMT study. As well, ranking minority member Representative Sam Graves has indicated his willingness to look into a VMT pilot. And in an opinion piece for the Washington Post, Senate Minority Leader Chuck Schumer (D-NY) warns that if the White House wants the 60 votes he'll need to adopt an infrastructure program, the plan will have to include measures to reduce greenhouse gas emissions and adapt to climate change impacts. At an event in Washington, DC earlier this month, DeFazio said his party would be prepared to work with the Trump White House on wide-ranging infrastructure legislation, even if it gave a Republican administration a win. "Infrastructure is to the benefit of all the people in the United States of America, Democrat, Republican, independent," he said. 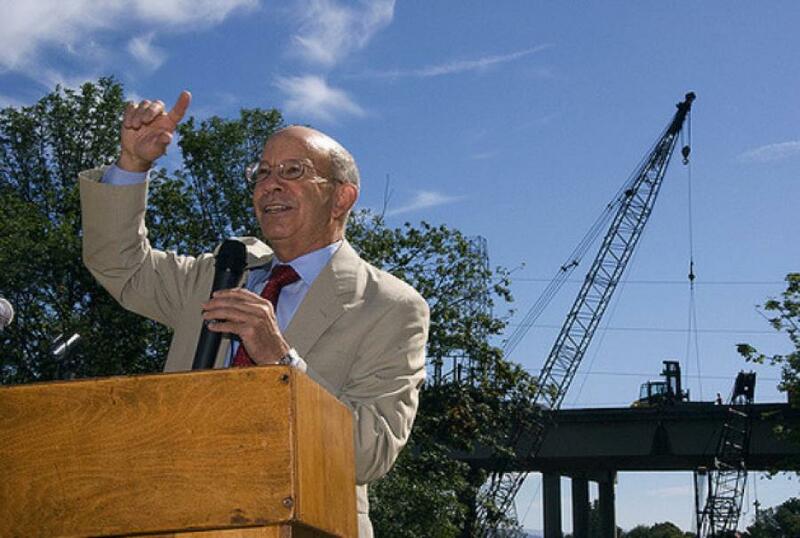 DeFazio's audacious goal is to get a House infrastructure bill done in the first six months of 2019, and he said he hoped the Senate "can act a little more expeditiously than usual." But getting the plan paid for will need Trump's help, he added, "because we're going to have to do some revenues, and we're going to need him to show people that it's okay to do a little bit of revenues." Meanwhile, Politico Morning Transportation reports that DeFazio is interested in a national VMT pilot with congestion pricing, based on positive experience in his home state. "You shouldn't charge a farmer who has to travel 20 miles to the feed store the same per mile fee as someone who jumps on 205 in Portland and causes a backup," he said. He also acknowledged the privacy concerns that still surround VMT programs, stressing that the pilot would allow participating drivers to opt in voluntarily. While DeFazio mapped out early elements of his agenda for House T&I, Schumer was out with a stark message for the White House: Even though Republicans hold a simple majority in the Senate, legislation generally needs 60 votes to pass, and Democrats' support for an infrastructure bill will depend on how well it addresses the global climate emergency. "Now that Democrats will soon control one branch of Congress, President Trump is again signaling that infrastructure could be an area of compromise," Schumer writes. "We agree, but if the president wanted to earn Democratic support in the Senate, any infrastructure bill would have to include policies and funding that help transition our country to a clean energy economy and mitigate the risks the United States already faces from climate change." Schumer sees the 116th Congress as an "extraordinary opportunity" for Democrats to force action on the climate crisis. "Not only will House Democrats have the power to propose, debate and pass progressive legislation on the subject, but Senate Democrats will have substantial leverage, as well," due to the 60-vote threshold required for a filibuster-proof majority. "Truthfully, infrastructure investment has been a priority for Democrats for decades," he writes, but there are specific priorities the Senate minority will be looking for in any White House bill. "We should make massive investments in renewable-energy infrastructure, especially in exciting new technologies such as battery storage. We also must make our infrastructure more climate-resilient." "No doubt, a single infrastructure bill alone will not solve our climate problem," Schumer acknowledges. "But it is an important and necessary first step to include at least some, if not many, of these ideas. Without them, Trump should not count on Democratic support in the Senate."